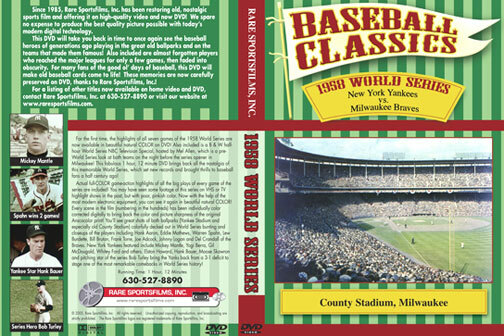 The exciting game-action highlights of all seven games of the 1958 World Series are now available on videotape - IN COLOR! Even though the 1958 series was the first one filmed in color by the old major league baseball Chicago Film Bureau, until now it has never been offered on video in color. In 1958, the series was filmed in Ansco-color and while for a year or two the color remained bright, after more than 45 years the color of that type of film has faded to bright pink, eliminating all blues and greens, etc. Up till now, all videos previously offered for sale have been sold in black & white, since even B & W looks better than pink! But now with the aid of the most modern, sophisticated color correcting equipment from "Rare Sportsfilms", the 1958 World Series can once again be seen in actual color! The 1958 series contains the high-water mark of the Milwaukee Braves success of the 1950's, for not only had they defeated the Yankees in seven games the year before, they lead the Yanks 3 games to one after four games of the '58 classic. In game one, Billy Bruton's tenth inning hit drives in Joe Adcock with the winning run and gives Warren Spahn a victory over Whitey Ford at County Stadium, Milwaukee. The next day, Bruton does even better than that, belting a leadoff homer to get the Braves off and rolling on a record-setting 7-run first inning, in which even pitcher Lou Burdette hits a three-run homer! The Braves continue to bomb the Yankees and tee off on five Yankee pitchers for a 13-5 win and a two-game-to-none series lead heading to New York. At Yankee Stadium in the third game Hank Bauer (eventually the batting star of the series), smacks a homer and drives in three runs, temporarily halting the Braves, as Don Larsen and Ryne Duren combine to blank Milwaukee 4-0. For game 4 Warren Spahn again faces Whitey Ford in a southpaw pitching matchup of the series opener. Spahn is dazzling, completely shutting down the Yankees 3-0 on only two hits. Young Norm Siebern, playing left (the difficult sun field at Yankee Stadium) loses two balls in the sun, which leads to Braves scores. Now trailing the Braves 3 games to one with two of the last three games left to be played at Milwaukee, the Yankees begin one of the great comebacks in series history in game 5. 21-game winner Bob Turley (knocked out in the first inning of game 2), shuts out the Braves 7-0 to keep Yankee hopes alive in the series. Elston Howard's key catch in left field is what some experts believe is the turning point of the series, as Billy Bruton is doubled up on the play. In their half of that inning, the Yankees knock out old nemesis Lou Burdette with a six-run outburst that clinches the game. Back in Milwaukee for game 6, veteran Warren Spahn loses a heart-breaking 4-3 10-inning game, which ties up the series for the Yanks. The Yankees are never ahead until the tenth, when Gil McDougald clips Spahn for a homer. After two more hits, Skowron's single scores an insurance run, which is needed as the Braves last-of-the-tenth rally falls one run short. It's Larsen against Burdette in game 7. The Braves score only one run after loading the bases in the first inning, and the Yankees get two gift runs in the second on two errors by usually slick-fielding Frank Torre. Turley replaces Larsen in the third ending a Braves threat, and goes on to finish the game, becoming one of the Yankee heroes of the series. Meanwhile, New York breaks a 2-2 tie in the eighth, when Yogi Berra doubles and Andy Carey singles with two out. Next up, Bill Skowron then smashes a game-clinching three-run homer that wraps up the series and a great comeback by the Yankees. At the time, only one other team, the 1925 Pittsburgh Pirates had ever come back to win a World Series after trailing three games to one! The '58 series was sweet revenge for New York, which had lost to the Braves the year before and it marked the beginning of the decline of the Milwaukee Braves.